10th Michelin Tourist Atlas 10.99 | What Car? This atlas is spiral-bound with laminated cardboard outer pages, but it feels a bit flimsy. The 1:200,000 scale works well with the near-A3-sized pages, giving enough information to navigate in all but the most-congested areas. The town maps are plentiful and have reasonable detail. The mapping is well laid out and the index and town maps easily found. The spiral binder means you can turn the pages quickly if needs be. The mid-page seam is large and occasionally distracting, though. The speed camera markers are tiny, too, and don't have speed limits marked, rendering them almost useless. The asking price is reasonable for an atlas of this quality and size, but we struggled to find a significant discount on the internet. The same atlas, but with a glued rather than spiral-bound spine, is available for 8.99. The spiral binder is a highlight, because the paper is extremely thin and prone to tearing if you're in a hurry. 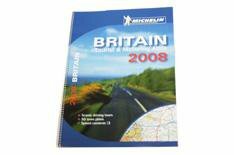 That's a shame, because Michelin has a fine reputation in mapping and this atlas doesn't do it justice. A section on scenic driving tours is a neat touch, but the key to the atlas is stuck behind it, not at the front of the book where you'd expect it. That can make trying to find it quickly a chore. Still, if you want to take in some sightseeing on your travels, it's useful, even if the whole of the UK is dispatched in five pages.